How your web pages rank in Google. Who is linking to your site. If there are any errors that are affecting your website’s visibility. What keywords your website ranks for. If your website has any security issues. With such powerful built-in tools, Google Search Console is a must have for any small business website. In this article, we discuss how to link your website with Google Search Console, as well as how to link it with other Google products to increase their functionality. To connect your website to Google Search Console first sign into your Google account (the same account you would use for Gmail, Google Analytics, Adwords etc), then go to https://www.google.com/webmasters/tools/. Once there you will be prompted to add in the URL of the website you want to link. Type in your website’s URL and click the red “Add A Property” button to add your website. Before you get access to Google Search Console, you will first have to prove to Google that you own your website. This can be done a few different ways, the most common being either adding a code snippet to the header of your website or uploading a file to the backend of your site. To verify your site ownership using a code snippet we will us the “HTML tag” option. 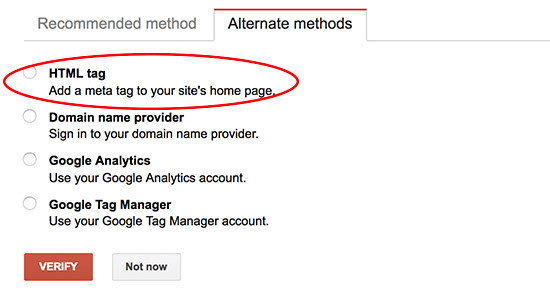 If this is not your recommended method, click on “Alternate methods” and then select “HTML tag”. Once selected, Google Search Console will give you a short snippet of code. This code will need to be added to the <head> section of your homepage’s HTML. Depending on how your website was built, there are many ways this can be done. If you are unsure of how you can add this code to your website, consult your web developer, or try verifying your website with an HTML file instead. For most websites, Google’s recommended method of verifying website ownership is by adding an HTML file to your website’s root folder. To verify your site with this method, select “HTML file upload” then download the HTML verification file to your computer. To get this file onto your website you will first need to login to your website’s cPanel. Once logged in, find and select your “File Manager” tool. If you are unsure about how to do this, or don’t know your login info, consult your web developer. In order to verify that you own (or at least manage) your website, Google Search Console will be looking for the verification file in the “root folder” of your website. By default, File Manager should bring you right to your website’s root folder. To double check before uploading, ensure that you are in the public_html folder. Once you’ve confirmed that you are in the right folder, click “Upload” and select the HTML verification file. After either uploading your HTML file or adding the code snippet to your homepage you are ready to verify your ownership. To do that simply click on the “I’m not a robot” reCAPTCHA and then click the red “Verify” button. 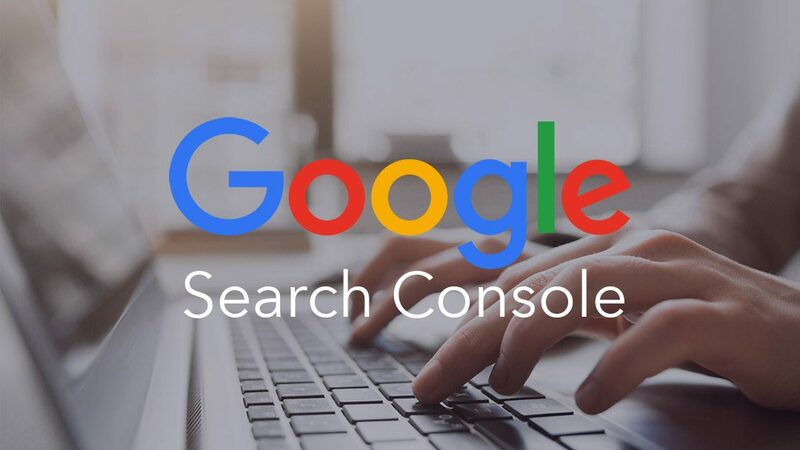 Your website is now connected to Google Search Console! We’re not done yet however. To truly take advantage of Google Search Console we will next link it with Google Analytics and Google Adwords. Why Link Google Search Console With Google Analytics? How well your webpages rank in organic search results, and how engaged people are with each of your webpages. Which keyword phrases your website ranks for. How well your website ranks in different counties. How well your website ranks on desktop computers vs tablets and mobile phones. While a lot of this information is available in Search Console, being able to get it all in one place is definite convenience. The added engagement data is also extremely useful when determining the success or failure of your SEO efforts. As an example of this, let’s say that you’re looking to improve your website’s ranking in search engines. You make some SEO changes to your website and you begin showing in more searches and getting more website traffic. This would be a success, right? Not necessarily. If we then look at our Analytics report and see that this extra traffic has a high bounce rate and low engagement, we could very well conclude that those changes were unsuccessful. After all, what’s the point of extra traffic if nobody sticks around to read your content? The process of linking Google Search Console with Google Analytics is fairly straight forward. First, login to your Google Analytics account. Once there go to Admin, then Property Settings. Scroll down until you see “Search Console” and click on “Adjust Search Console”. This takes you to “Search Console Settings”. Clicking the “Add” link will redirect you to Google Search Console and display a list of all of your verified websites. Click on the website that you want to link and click “Save”. Your accounts are now linked! Why Link Google Search Console With Google Adwords? Adwords is Google’s advertising platform. It allows you to serve text ads to people as they search on Google (Search Ads) as well as image, text, video and other rich media ads as they surf the rest of the internet (Display Ads). It allows you to discover new keyword opportunities. Search the report for new keyword phrases that you haven’t already thought of. It allows you to see which keywords you rank well for organically. If your website already ranks highly for certain keywords, you can stop bidding on them and instead focus on the keyword phrases that you don’t rank well for. The Paid & Organic report can be found in the new Adwords interface by clicking on the Reporting icon, then selecting Predefined > Basic > Paid & Organic. To link your Search Console and Adwords accounts, first login to your Adwords account. Click the settings icon, then under “Setup” click on “Linked accounts”. Scroll to the bottom of the page and click the “Details” link within the Search Console box. Click on the blue “+” circle on the top left side of the page and type in the URL of the website that you want to link, then click “Continue”. Your Google Adwords and Google Search Console accounts are now linked!